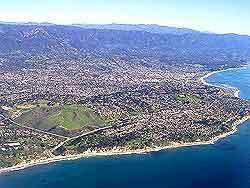 Santa Barbara is situated in a naturally beautiful location in Southern California that encompasses a superb ocean coastline and the Santa Ynez Mountains. With a population of 100,000, the city is much smaller and more relaxing than the nearby cities of Los Angeles, San Francisco and San Diego. Santa Barbara is known as the 'American Riviera' because of its perfect coastline, good climate and historical influences from the Spanish and the Mexicans. Many people from nearby cities and tourists from abroad find Santa Barbara the perfect place to enjoy a holiday. Join a tour of the impressive Mission Santa Barbara, with its twin towers, museum and scenic grounds. Built in 1786, this Franciscan mission is still in use and is popularly known as the 'Queen of Missions'. View some of the exquisite artwork on display at the Santa Barbara Museum of Art, established in 1941. Paintings from Latin America, early western America and Asia are on show and can be seen on tours of the building.